The tropical Kingdom of Cambodia borders Thailand, Laos, Vietnam and the Gulf of Thailand. It is a multiparty democracy functioning under a constitutional monarchy. The country’s terrain is mostly characterised by low plains and a few mountain ranges in the north and south. 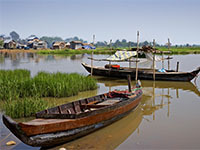 The beautiful Tonle Sap lake, the gushing Mekong and Bassac rivers, and the relaxing beaches along the Gulf of Thailand make Cambodia’s landscape picturesque and inviting. 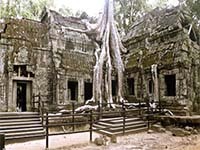 It is also one of the most heavily forested areas in South East Asia. Pilgrims from across the globe flock to the staggeringly beautiful temples of Angkor that have finally gained peace along with the rest of Cambodia after decades of unrest. Explore the wilderness of the upcoming eco-tourist hotspot, the Cardamom Mountains. 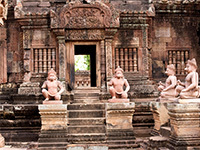 Wildlife enthusiasts have an opportunity to indulge in Preah Monivong National Park (a.k.a. Bokor National Park) hosting many endangered species including the tiger, learning to be mahouts in the villages of the Mondulkiri region and sighting endangered Irrawaddy dolphins in the riverside town of Kratie. The more adventurous tourist might consider a trip to Tuol Sleng Genocide Museum, the haunting spot of the Khmer Rouge killings. The beaches of Sihanoukville and the unexplored southern coastal islands, lend to Cambodia’s eloquent charm. Cambodia’s people have emerged victorious after a long lasting political struggle and are willing to welcome tourists and celebrate this victory with them. The capital city of Phnom Penh and the upcoming Siem Reap are culture hubs you wouldn’t want to miss! Safety Note: There are still many undiscovered and active landmines in remote and un-treaded parts of Cambodia. Tourists are advised to stick to charted territories. 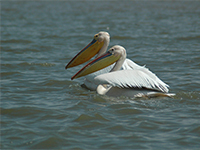 Over 212 mammal species, 536 bird species and 240 reptile species are present in Cambodia.